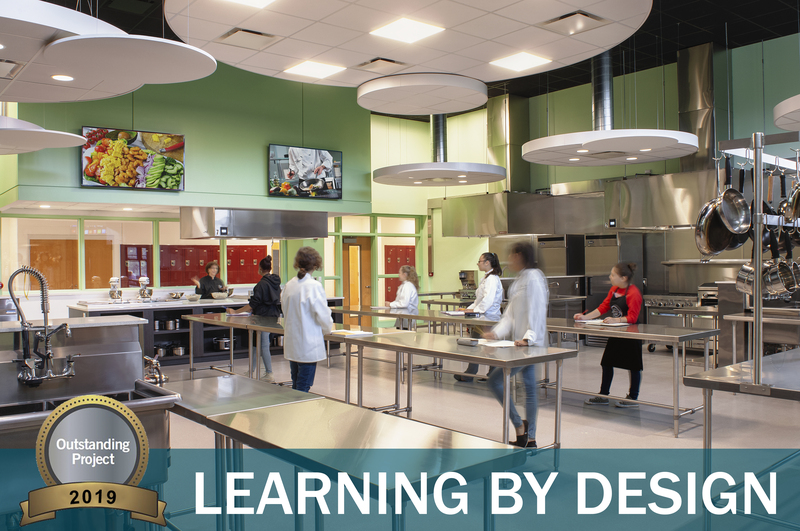 LAN Associates received an Outstanding Project Award for educational design of the Leonia High School – Culinary Arts Lab and Classrooms Addition in the spring 2019 edition of Learning by Design.Learning by Design’s distinguished spring 2019 jury awarded LAN for the design of the state-of-the-art facility. Enrollment into the program has increased 80% since renovations and a waitlist has been created for additional eager culinary students. LAN’s modern design approach features a large instructional island and six individual learning kitchens for students and teachers to prepare their dishes are spread across the space. As a leader in educational design, LAN specializes in designing spaces that extend beyond a typical classroom, creating student-centered learning environments that sparks creativity and meets the needs of every learning style. LAN proactively explores and implements innovative and advanced design elements that support their education initiative and Leonia High School is a prime example. Integrated technology was specified to include a live-feed instructional camera so that cooking preparation can be viewed on demonstration TV’s throughout the space for students. “Through interdisciplinary learning areas and cross-curricular programs, the opportunities for students are limitless,” said Matthew Fink, AIA, LEED AP BD+C, Design Architect. “This lab jump starts students’ passions and careers, while promoting innovation and creativity, and that’s our ultimate goal as a design firm. In addition to the lab, a large courtyard was created to provide unique learning opportunities for students and teachers in an outdoor setting. The courtyard is an ideal space to host outdoor culinary events and group lessons. The Learning by Design jury selects award recipients that use new concepts to improve education facility building design and score projects using six core design criteria including; innovation, meeting the community’s needs, interior design, sustainability, functional design, and 21st century learning. LAN was selected for their spring issue and the magazine additionally publishes in the summer and fall, circulating to an overall amount of 50,000 people.